I have a soft spot in my heart for old school American Chinese restaurants. They are the food of my childhood, serving up comforting favorites like crispy egg rolls, chop suey and day-glo orange sweet and sour pork. Theses restaurants may not have been authentically Chinese but they served up some delicious food and the Ho-Wah in Phoenix Arizona was no exception. It is long gone but is, to this day, the standard by which I judge all American Cantonese restaurants. A storefront with an old neon sign and a very particular typeface will stop me in my tracks every time. The food may be hit or miss but when I’m lucky enough to find a good one, it brings me right back to those childhood meals at Ho-Wah and I’m happy. As a kid, I really liked the cookies that came at the end of the meal. What kid doesn’t? They aren’t Chinese in the least bit, rather American through and through, but we all look forward to them. At Ho-Wah this always meant a fortune cookie and an almond cookie for every person. One was rather tasteless and came with curious messages I never really understood as a kid. My preference was the almond cookie, especially dunked in hot tea. 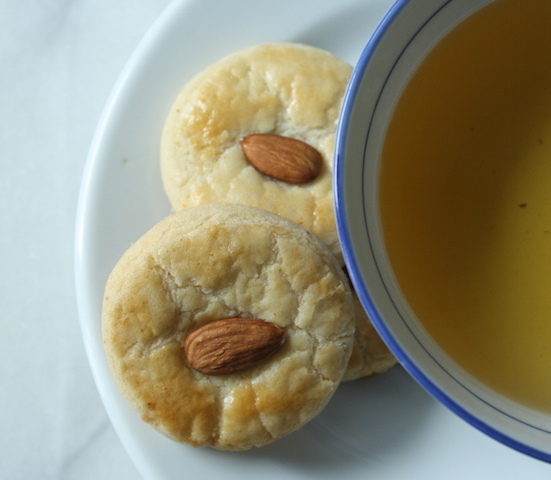 It was crunchy and crumbly with a nice almond flavor and soaked up the tea in the best possible way. I happily crunched away while trying to figure out what Confucius was trying to tell me. And who Confucius was. I wandered past a Chinese bakery last week and decided to pop in for some dim sum to go. I noticed they had a few kinds of almond cookies – large sleeves of a dozen or so that were identical to the restaurant versions, but in the bakery case were larger and better looking cookies. Large, flat, covered with cracks and that interesting egg yolk yellow color that I’m sure is from a touch of food dye rather than actual yolks. I bought a few of those. Once home, I brewed a pot of tea and dunked away. Delicious even if there were crumbs all over the place. 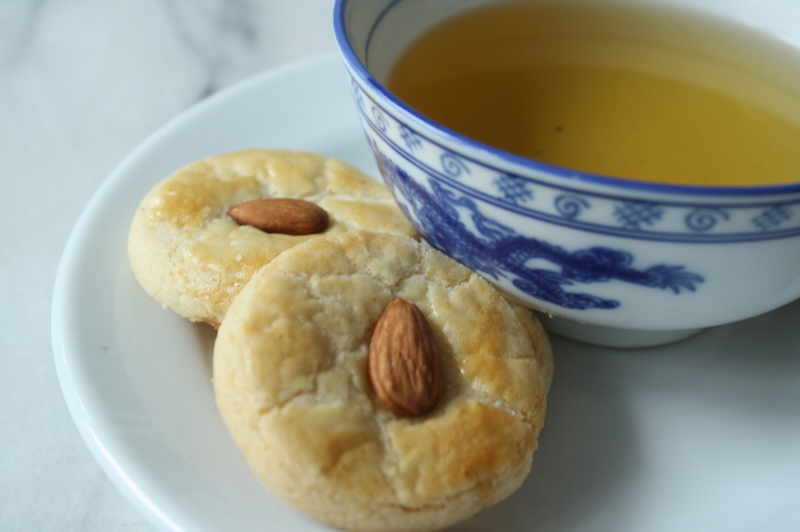 No one ever said eating Chinese almond cookies was a neat endeavor. I thought maybe I’d make some for Chinese New Year. Something a little less artificially dyed and flavored so I started researching. Most online recipes were all fairly similar and loosely built around a shortbread formula. Butter, flour, powdered sugar. The almond flavor came from extract rather than almond flour, which sounded right. So I settled on a recipe and tried it. I should have known better. It had cake flour, which is all wrong. Though the source sounded right, the cookies were all kinds of wrong. Too soft, too cakey and absolutely not dunkable. No. Not liking what I was seeing online, I went old school. 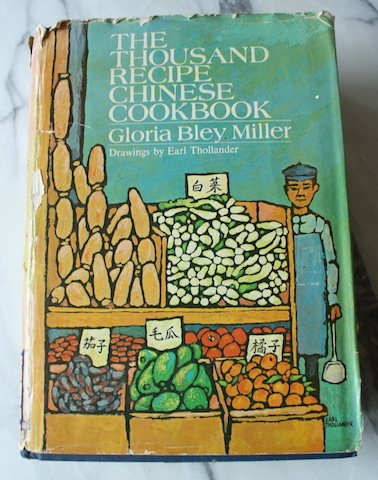 It was time to consult my Polish grandmother’s favorite cookbook so I grabbed her copy of The Thousand Recipe Chinese Cookbook off the shelf. It was heavy, nearly 1000 pages, with a well worn dust jacket and as I flipped through I came across all her little page markers. 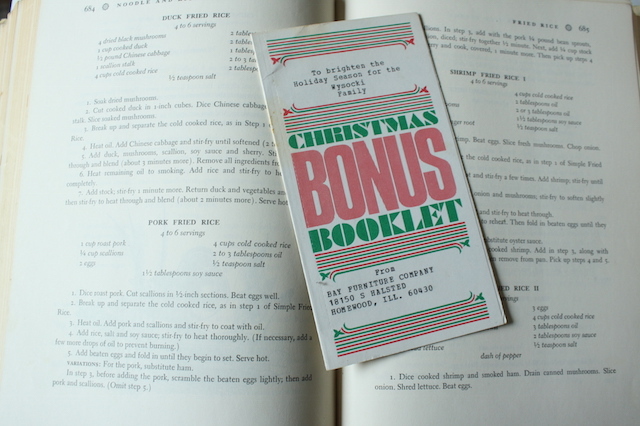 She had marked off egg drop soup with a Disneyland playing card, the fried rice pages with a Christmas card from a furniture store and stir fries with a letter from Time-Life books thanking her for her order. I have those Time-Life books too. Paging through my grandmother’s cookbooks is a treasure hunt; I never know what I’ll find stuck between the pages and I love it so much. 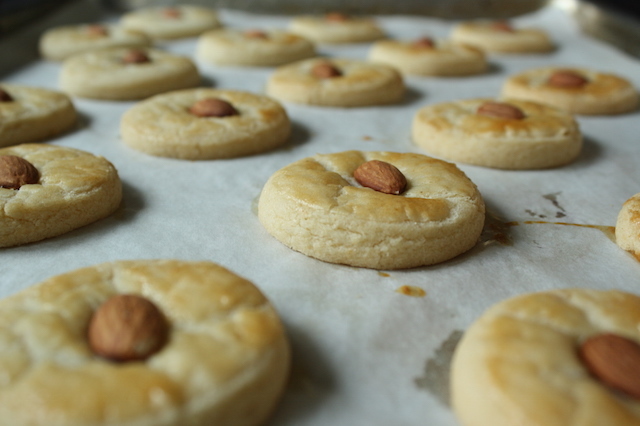 I turned to the index and found a few recipes for almond cookies. I should have done this from the start; the pork fat and baking powder in the recipes looked very promising. I am so accustomed to using butter that I forget lard makes a wonderful cookie and it makes sense that a Chinese cookie would use pork fat. I changed the recipe slightly, using almond flour rather than grinding almonds since not only is it easier, the flour is readily available, which it wasn’t in 1974. I also added vanilla and increased the salt a smidge. The dough rolled and cut like a dream, not requiring the hour of two of refrigeration that a butter cookie might. These are wonderful, not quite like the large, yellow bakery cookies and not quite like the crunchy restaurant version. Maybe a bit more refined but just as delicious with a nice, subtle almond flavor. I enjoyed them very much, especially with a strong cup of tea. Make a batch and share them with your neighbors to celebrate the Chinese New Year this weekend. I think they’d be delighted. STRESS THERAPY BAKING FACTOR: RELAX. Who doesn’t enjoy a nice cookie and a cup of tea? We all need to slow down and take a breathe. Even better, these are lovely enough to make any day of the year and there’s nothing particularly difficult or stressful about them. For a rolled/cut cookie, it’s a pretty easy one. The dough doesn’t have anything particularly unusual, it comes together quickly and doesn’t require a wait to chill. Don’t want to make them all at once? Freeze the dough after cutting and you can bake a few at a time, whenever you like. It doesn’t get much easier. Preheat the oven to 350°F and line 2-3 sheet pans with parchment paper. In a medium bowl, whisk together the flour, baking powder and salt. Set aside until needed. In the bowl of a standing mixer fitted with the paddle attachment or with a hand mixer, cream the lard and sugar on medium-high speed until light and fluffy. About 3-4 minutes. Add the egg, almond flour, almond extract and vanilla. Mix until well blended. Scrape the bowl. Gradually add the flour mixture and mix on low until fully incorporated. Do not overmix. Turn the dough out onto the counter and give it a few gentle kneads to fully blend. Divide in half and on a lightly floured surface, or on a piece of parchment paper, roll half the dough to ¼” thick, lightly flouring the top to prevent the rolling pin from sticking. With a 2” round cutter, cut out rounds of dough and place ½” apart on the prepared sheet pans. 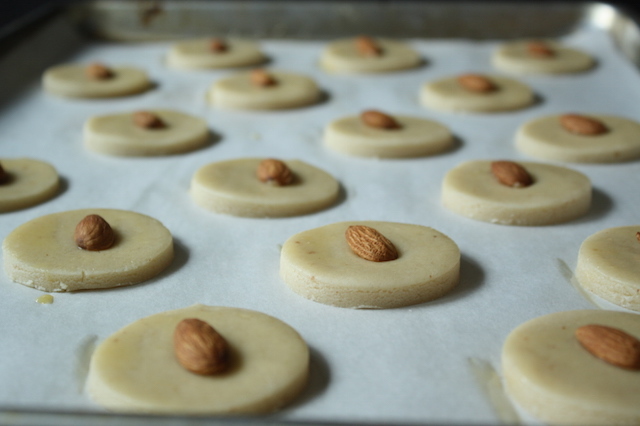 Brush each cookie with the lightly beaten egg and gently press a whole almond into the center of each circle. Bake until golden brown, rotating the pans halfway through, about 15-16 minutes total. Sitting here laughing. As soon as I saw that cookbook, I ran and checked to make sure you hadn’t “appropriated” my copy. I love that cookbook. 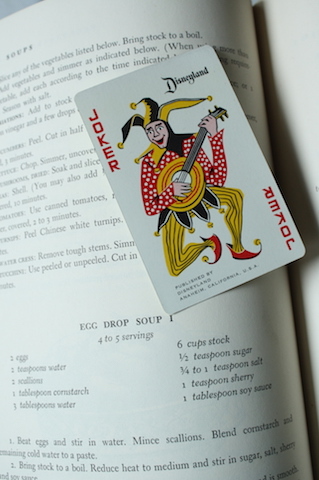 Never know when you’ll need a recipe for fish maw soup or Yangchow fish balls.